In Gaza about 2/3rd of the total population of 1.8 million are refugees of which about 500.000 live in eight refugee camps and the rest in the neighbouring towns and cities. Several studies conducted by some active organisations such as UNICEF, UNRWA and Gaza Community Mental Health Programme reported that the deteriorating situation in Gaza has severe impacts on the psychosocial well-being of the population, especially children, women and elderly people. 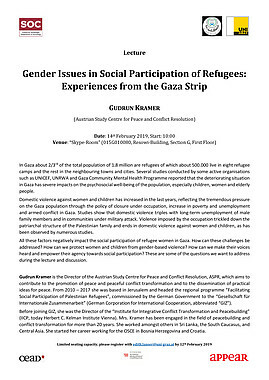 Domestic violence against women and children has increased in the last years, reflecting the tremendous pressure on the Gaza population through the policy of closure under occupation, increase in poverty and unemployment and armed conflict in Gaza. Studies show that domestic violence triples with long-term unemployment of male family members and in communities under military attack. Violence imposed by the occupation trickled down the patriarchal structure of the Palestinian family and ends in domestic violence against women and children, as has been observed by numerous studies. 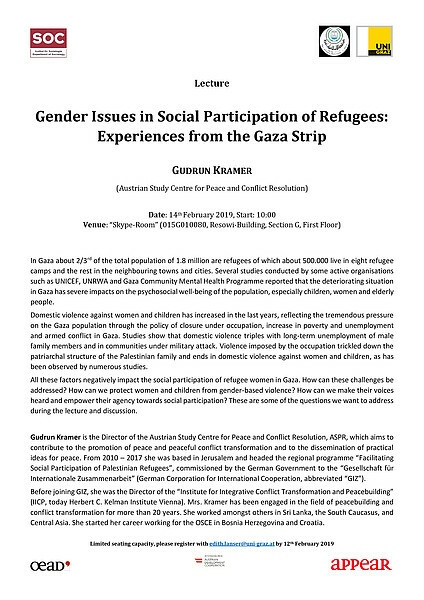 All these factors negatively impact the social participation of refugee women in Gaza. How can these challenges be addressed? How can we protect women and children from gender-based violence? How can we make their voices heard and empower their agency towards social participation? These are some of the questions we want to address during the lecture and discussion. Gudrun Kramer is the Director of the Austrian Study Centre for Peace and Conflict Resolution, ASPR, which aims to contribute to the promotion of peace and peaceful conflict transformation and to the dissemination of practical ideas for peace. From 2010 – 2017 she was based in Jerusalem and headed the regional programme “Facilitating Social Participation of Palestinian Refugees”, commissioned by the German Government to the “Gesellschaft für Internationale Zusammenarbeit” (German Corporation for International Cooperation, abbreviated “GIZ”). Before joining GIZ, she was the Director of the “Institute for Integrative Conflict Transformation and Peacebuilding” (IICP, today Herbert C. Kelman Institute Vienna). Mrs. Kramer has been engaged in the field of peacebuilding and conflict transformation for more than 20 years. She worked amongst others in Sri Lanka, the South Caucasus, and Central Asia. She started her career working for the OSCE in Bosnia Herzegovina and Croatia.